There is a definite cause-effect relationship in this world. If every human and humankind as a whole chooses the Path of the Truth, then not even the most sophisticated and cunning lie will be able to resist it, and as a result it won’t be able to win. The entire system will break and crack like a dilapidated, decayed wheel, if it collides with those who have made their final choice in favour of Goodness, and hence, in which world they want to live, and in which they don’t. On 11.02.2019, the Spiritual World delighted all of us with another Gift. A very interesting and extremely honest programme (just like all others) with Igor Mikhailovich Danilov was released — Climate. The Future is Now, where in a frank and sincere conversation all the i’s were dotted. Everything was said explicitly: about how much time is left, what needs to be done, and why every person’s choice is so important? After watching the programme, it became even clearer how important is the choice of each person who has already come to know the ALLATRA Primordial Knowledge. How important it is for such a person to responsibly treat the Honour to be the Messenger of the Truth. Namely the one who carries the Message of the Truth, the most important Message for every Person! He or she carries this extremely important Message to all people! After all, on sincere, active, amicable, and consolidated efforts of each Messenger of the Truth it depends how quickly all other people will get to know about the Knowledge and therefore will be able to make their conscious choice. An interesting point has come out in how the Animal Mind system works in the minds of people, which was noticed in communication with like-minded people. Some of the guys shared that the words spoken in the programme with such Love, care and concern for us, were deftly twisted by consciousness into a means to manipulate Personality. That is, consciousness began to accuse these people of inaction. More precisely, to incline them to this. Namely, the words and what was embedded in them, which in fact were supposed to inspire Personality to be even more active both in work on oneself and in social volunteer activities, were used by the system to demoralise individuals. To help such people, I would like to note that if the only enemy of every human tells you that you are guilty of something, that you are so-and-so, it means that he is terribly afraid that you will correctly perceive what Igor Mikhailovich said and, having risen in the Spirit, you’ll be able to do a lot of useful things both for yourself (in spiritual development) and for other people. Hence, you have a great potential for this, since the system is so violently indignant and blames you. Also, I’d like to remind of what most of you already know, that the Spiritual world — God never blames anyone, a human is blamed only by the devil — the system. Therefore, you have the right of choice: to listen to deadly lies of the enemy, or to finally hear the words of the Best Friend. Also, in communication with like-minded people, another clever trick of the perennial liar was noticed. It’s when an action aimed at dissemination of the Knowledge is purely formal. The system skillfully redirects person’s attention and potential to self-admiration and pridefulness. Basically, a purely mechanical keystroke to share with everyone in Whatsapp (Viber, Telegram) is presented to Personality as something heroic, as a great contribution. By lulling the Personality with such implanted thoughts, consciousness thereby covers the essence from a person, the essence which is primarily in the fact that every person who gets to know the Truth gains a chance to start living by it and telling others about it. But truly living and truly telling. What does it mean? Not to seem, but to be; and not to pretend, but to act! Sharing the Primordial Knowledge in the messengers is so natural that every person who’s aware of the entire importance of the Knowledge can implement this just as naturally as he or she breathes. ”A person who has stepped on the path of Spiritual growth essentially does two main things in life: he’s growing himself and conveys (helps others) to gain a chance to grow. What prevents one from conveying information to others? Thoughts and patterns from consciousness: what people will think about me, how they will react. And let’s figure out: who says this to me inside, why does he say it, and who will react in another person? The answer to the first two questions is obvious: it is consciousness which opposes and hates everything spiritual says that. Who will react and how? This is the choice of a person already. Thus, we can ignore incitations of the enemy and do what the Soul suggests. Let’s repeat, that we have no enemies. Those who obey orders of the system, that is, who are its slaves, are just deceived and deeply unhappy people, for they themselves don’t understand what a deep pit they are digging for themselves, from which they won’t be able to climb out. But even to such people, the Gracious and Merciful Spiritual World gives a chance today. A chance to make a choice in favour of Goodness. And here the words were said, which today might refer to many inhabitants of the Earth. Yes, dear reader, in each of us there is such a beast, an indifferent beast which was mentioned above. (Which fulfills all the most inhuman orders of satan’ slaves). But there is an Angel in each of us, too. The only question is on whose side our consciousness is. And whom it serves. If we force it to serve the cause of Unification of all people on the Earth, to serve by disseminating the Primordial Knowledge (which can bring salvation to everyone) among all people, then it means not everything is lost. Indeed, everything depends on our choice. So, why don’t we get inspired by this, rejoice at it? That, after all, we ourselves choose in which world we want to live, and in which we don’t. After all, it’s so inspiring and so delighting that we can choose on our own. Gratitude to the Spiritual World for giving us, humans, the right of choice. How else can we express our Gratitude, sincere Gratitude, if not by making the choice in favour of the Spiritual World — in favour of Goodness, Love and Harmony? Dear reader, remember that today a lot depends exactly on your choice. And today, the Spiritual World Honours every person by creating conditions for everyone to make their own contribution to creation of a bright future. So, let us be worthy of this Honour! After all, the Earth is our home, too. Yes, it’s a temporary home, but indeed it’s common! And when we’ve talked about those who muddy the water and who make only less than one percent of the total number of people, we’ve said that in order to emphasize that the Earth belongs not only to them, but to us as well. 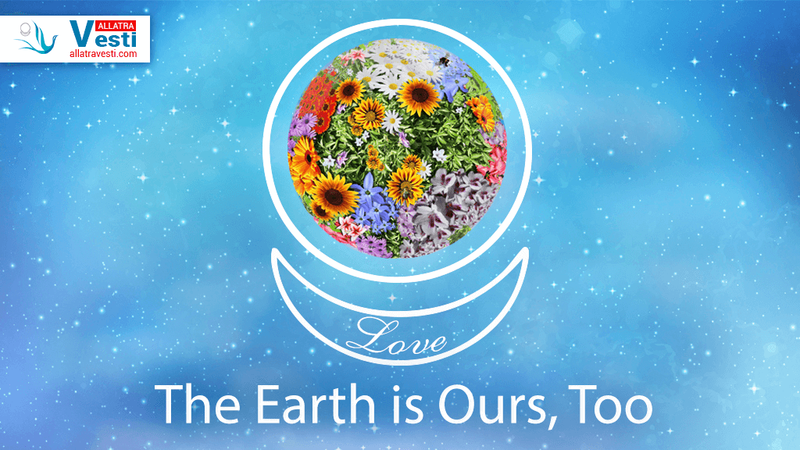 And for us, for all people, the Earth has been given with all its benefits. And if we give the right to decide everything for us into the hands of this one “water-muddying” percent, then who, if not us, is to blame for the fact that such obscurantism is happening today? Isn’t the Earth given to us, our descendants, and all people on the Earth? Without any boundaries at that. After all, no boundaries are visible from the sky. And just as in our True Home – the Spiritual World – there are no divisions, so it should be the same on the Earth, meaning should be no divisions. And why we, people, hand over the entire responsibility to these slaves of the system, slaves of Ego? Why are we afraid to take responsibility for ourselves, for our lives, for our Choice? After all, everything depends on us in fact and on our choice: how we will act. If we really treat this so that yes, problems that humanity is facing today are common problems, this is a problem for each of us. Then, correspondingly, each of us, having put our efforts to solution of these problems, becomes worthy of the name of a Human. Otherwise, if we continue to treat this as if it’s a problem of the government, it’s a problem of the state, it’s a problem of various authorities, for example, that very problem of climate is a problem of the Ministry of Emergency Situations, and may they be the ones to deal with this, while my business is to work in a bank, to dig the ground, to grow children, and so on, and so forth. No! Governments, rulers, the Ministry of Emergency Situations are the same people as everyone. And what do their ranks mean before the millennial rage of nature? Nothing! Whereas people united by ALLATRA, that is, in Goodness, Friendship, Brotherhood, and Harmony – this is power! The power in front of which all natural disasters are nothing. More precisely, we will be able to resolve any consequences of any cataclysms if we are united. Otherwise, death is awaiting us all. And everything depends on our choice. It’s important to understand and accept the whole seriousness of the situation, and it’s important to understand how significant the choice of everyone is today. Of absolutely every person, if a person understands and realises a simple thing that the Earth is ours, too. And if it is common, our common home, then let’s resolve all its problems together. After all, this is exactly happiness for the Spiritual World. So, let’s delight ourselves and delight the Spiritual World, as it is so simple. There was a movie when natives in the fight against alien enemies made the only right strategic decision – to unite in the face of menace. The main character of the movie, when addressing the population of that planet, says that it is necessary to fly as fast as the wind and to call all the clans… And, having united, they won! Today, we have a unique opportunity to create the Golden Millennium! It is more than realistic! However, in order for this to happen, it’s extremely important for all those people who have already come to know the ALLATRA Knowledge to fly as fast as the wind and to carry the news of ALLATRA to all people on the Earth! The sooner all people get to know the Truth, the sooner they will be able to throw off the shackles in their consciousness, and therefore to become free builders of a new life – the bright and harmonious one! In fact, only those free from slavery can build such a life. What prevents us from doing this? Only shackles in consciousness. But we do have the tools to break these shackles. Having thrown them off ourselves, and telling everyone else how to do it, we will change everything! Today, many people from all over the world who have become ALLATRA IPM participants prove by their personal example that this is more than possible! And it’s today’s reality. And to make these changes more large-scale, global, and faster in time, everything actually depends only on us. On ourselves. Even you, dear reader! You can obey thoughts in your head that are now telling you, Sure, how can this be changed? What is possible to do there? What can these do there? It has always been like this! What can some participants do… Or you can just believe and trust the call of your heart. And start at least from telling about this Knowledge to all those who are dear to you. Whom you communicate or work with… Doesn’t matter… And then everything begins to change. Why? Just because you’ve already stopped to be indifferent, neglectful, and weak-willed. You have already shown solidarity, you have already wanted this change and made the first step towards this! While every path, even the longest one, begins with a first step! You just need to go fast like the wind, with the news of ALLATRA, and WE shall win!